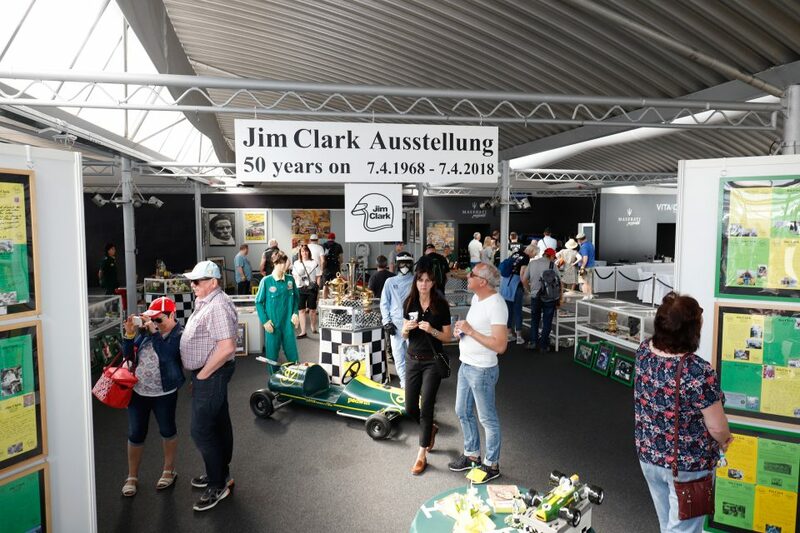 One of the wonderful traditions on the occasion of the Bosch Hockenheim Historic is the Jim Clark exhibition in the Conference Pavilion. Every year the Mallepells, a Swiss couple, presents new and exciting finds in Hockenheim with passion and meticulous attention to details. The eye candy is sure to be the Lotus 59 FII car with the Gold Leaf design from 1969, including the matching mechanic overalls from 1968. This place invites visitors to slow down. Showcases and partitions will display the racing legend’s final autograph, a personal letter and over 50 statements from friends and contemporary witnesses regarding Jim Clark; plus books, magazines, photos, posters, model cars and much more. One showcase will be dedicated to Lotus founder and Clark promoter Colin Chapman in 2019. Two small special exhibitions will round things off: one about the racing driver Karl Foitek, who met Jim Clark several times in person – and one about Ayrton Senna, who had visited the Jim Clark Museum in Scotland in 1991.